Another week goes by and we continue to have gorgeous, non-humid weather. Not sure that is so good for the tomatoes….I know the CSA has had trouble with the tomatoes this season. My own garden tomatoes are suffering as well…so sad. Yet with an occasional good tomato or two and abundant cherry tomatoes, I don’t feel too deprived. This week I thought I would highlight a couple of my family’s standout CSA meals one again. Both meals used eggplant, which we are going to be receiving again this week, so I thought I would also highlight eggplant as the week’s featured vegetable (see below). Another memorable CSA meal this week was Ratatouille Soup with Dairy Free, Gluten Free Corn Muffins. I don’t often make soup in the summer, but the rather cool weather enticed me to make it for lunch one day when I didn’t have any other leftovers around to eat. The ratatouille themed soup makes great work of the CSA eggplant, tomatoes, peppers, summer squash/zucchini, and even cabbage. See below for recipes. A note on cucumbers—my family is not in love with cucumbers. After a couple of weeks of eating them, the rest of my family typically goes on strike and it is up to me to finish up the bounty. At this point in the season, I like to start putting sliced cucumber in my mint water. I have a huge garden of mint and always have fresh mint steeping in a pitcher of cold water in the fridge. By the middle of the CSA season I typically start adding sliced cucumber to the mix. It makes for a very refreshing, low calorie summer drink. If you have a recipe to share or have comments regarding some of my recipes, please let us know by commenting on the blog….I would love to hear from more of you! While many varieties and colors of eggplant exist, two general types are most familiar in the US. They are globe (or bell) and Asian eggplants. Globe/bell, or Italian-style eggplants, are large, oval or round shaped, and typically a dark shade of purple, whereas Asian eggplants tend to be long and thin, and of a lighter color (with some variations). While the size and shape of the two types of eggplant lend themselves to slightly different preparation methods, their ultimate taste is barely indistinguishable. Some argue that Asian eggplants are less bitter; however, bitterness tends to be a function of age and skin. In general, eggplants that are harvested later or kept too long in storage tend to be more bitter. Some say that the thicker skins of globe eggplants contribute to their increased bitterness over Asian varieties. 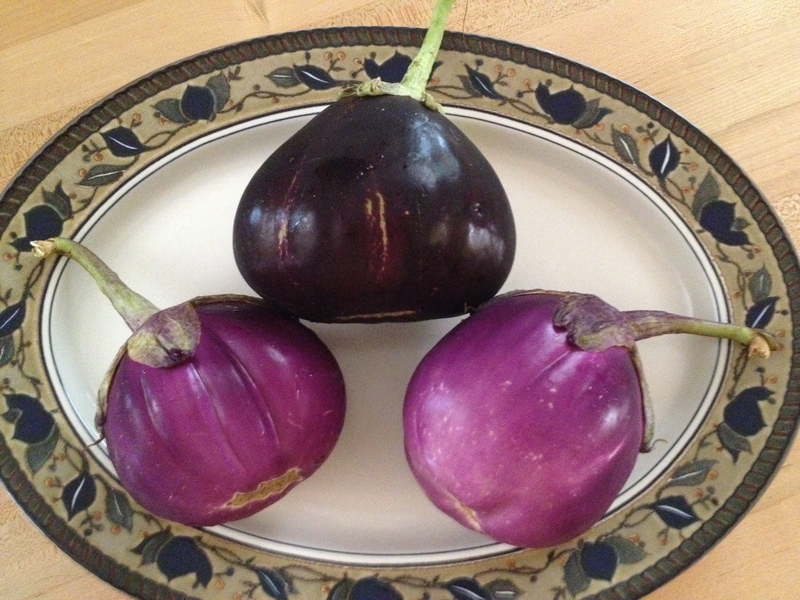 However, if they aren’t too big or over-ripe, globe eggplants can be as sweet and succulent as the Asian types. Many people opt to peel globe eggplants before cooking to avoid bitterness and a tough exterior, although it is simply a matter of preference. When prepared correctly, eggplant is a divine food, with a silky soft flesh and rich taste. It is prized in Mediterranean and Middle Eastern cooking, where it stars in dishes like Greek Moussaka, Middle Eastern Baba Ganouj, Italian Caponata, and French Ratatouille. It pairs great with many types of meat and other seasonal vegetables, especially tomatoes and zucchini. Eggplant needs to be cooked fully in order to achieve its signature creamy texture and rich flavor. Undercooked eggplant is rubbery and unappetizing. Eggplant can be steamed, roasted, baked, sautéed, and grilled. However, I have found that on the grill or in a sauté pan it can tend to dry out before it gets sufficiently soft. This is often avoided by a) adding water or another liquid to the pan, b) by lowering the temperature, c) by covering it during and after cooking to allow steam to re-moisturize it, and/or d) by “sweating it”. Eggplant’s spongy texture causes it to soak up most of the oil or fat in a dish, which often leads to too much calorie-laden oil being added and absorbed. This is why recipes often direct you to “sweat” the eggplant first by salting it. The salting apparently makes the eggplant less absorbent and spongy. Some say it also removes bitter flavors. Sweating is generally not necessary for smaller, Asian eggplants, but is often recommended for globe eggplant. To “sweat” eggplant, slice or cut it into desired shapes. Place in a colander and sprinkle with salt. Toss to distribute evenly. Allow to sit for 1 hour. Dry with paper towels. Proceed with preferred cooking method. Choose firm eggplants without marred or bruised skin or soft spots. Stems should be nice a green. The ideal temperature for eggplant storage is 50 degrees, as colder temperatures tend to increase spoilage and bitterness. This requirement is a challenge for us here in the northeast as most cellars are hotter than this in the summer. You can leave an eggplant out on the counter for a few days, but if you need to store it longer than that, refrigerate it. Store unwashed eggplants in plastic or a kitchen towel in the vegetable bin of your refrigerator. Make sure the eggplant has plenty of space so that it doesn’t get bruised by other items, which can cause the eggplants to spoil and develop a bitter taste. Eggplants should keep at least a week in the refrigerator, but they may get more bitter the longer they sit. Cooked eggplant freezes very well, as do pre or partially cooked eggplant casseroles (like Eggplant Parmesan). According to Janet Chadwick in The Beginner’s Guide to Preserving Food at Home, blanched eggplant can be frozen as well. Add lemon juice to the water (1/4 cup per ½ gallon) to prevent discoloration and blanch for four minutes. Drain, pat dry and freeze. This recipe is an adaption of a version given to me by a friend of mine. The method of boiling the eggplant first in salt water guarantees a silky soft texture in the finished dish. Bring a pot of water to boil and add the eggplant and salt. Boil for 8 minutes. Drain the eggplant in a colander and press to remove excess liquid. Heat the oil in a skillet and saute the onion and garlic for 5 minutes. Add the eggplant and saute for 5 minutes more. Add the tomatoes, red pepper flakes, black pepper, smoked paprika and cumin. Let bubble for 10 minutes. Stir in the lemon juice and garnish with the basil or parsley. There are many ways of making a Spanish Tortilla. This version is adapted from a Spanish Tapas Boot Camp I attended at the Culinary Institute of America. Another way to make this it is to cook it until the underside is golden and the egg begins to cook throughout. Instead of transferring the tortilla to a plate, transfer the skillet to the oven and broil about 6 inches from the heating unit until the top is golden and the egg is puffed and no longer runny. While this is a traditional Tapas appetizer, it makes for a great breakfast or lunch entrée. Just cut into triangles instead of small bite sized squares. 1. Heat olive oil in a large skillet (preferably cast iron). Add the potatoes and the onion. Season lightly with salt. Cover pan and cook over medium heat, turning occasionally, until potatoes are tender but not brown. Drain off the oil from the potatoes. Reserve the oil. 2. In a large bowl, lightly beat eggs with 1-teaspoon salt and paprika. Add potato mixture to the bowl with the eggs, submerging the potatoes completely. Allow to stand for 10 minutes. 3. Wipe out skillet. Heat 2 tablespoons of the reserved oil in the skillet over high heat until hot. Reduce heat to medium and add the potato-egg mixture. Allow mixture to cook, shaking pan occasionally to prevent sticking, until the bottom of the tortilla is lightly browned. Place a large plate over the pan and flip the tortilla upside down on the plate. Add 1 tablespoon of the reserved oil to the pan and swirl to coat all sides. Slide uncooked side of the tortilla back into the pan. Cook until browned. Transfer to a plate and let rest 5 minutes before serving. 4. Cut into rough squares and serve with toothpicks either while still warm or when cooled to room temperature. This recipe was adapted from theprudentwife.com (click here for original). I reduced the amount of fat and added pureed raw summer squash to the batter, which makes for a lighter yet super moist cornbread. These muffins have a decidedly coconutty taste (which I love), mostly from the coconut milk. If you wish to keep them gluten and dairy free but want to minimize the coconut flavor, try substituting almond milk for the coconut milk and olive oil for the coconut oil. If you don’t care about dairy and want to reduce the coconut flavor, substitute buttermilk for the coconut milk and butter for the coconut oil. 1. Preheat oven to 350℉. Line 2 muffin pans with 16 cupcake liners. Spray liners with coconut oil or olive oil spray. Set aside. In a large bowl, whisk cornmeal, coconut flour, baking powder, sea salt and sweetener. Make sure all coconut flour lumps are broken up. 2. In a blender, blend coconut milk, eggs, chopped summer squash, and coconut oil just until smooth. 3. Pour wet ingredients over dry ingredients and incorporate by folding with a spatula. Fold in basil. Let mixture sit for 5 minutes. It will thicken up. 4. Divide mixture among 16 muffins. Batter should fill each one at least 3/4’ s full. Bake for 18-20 minutes or until centers bounce back when touched and tester comes out clean. Immediately remove muffins from tin and allow to cool on a rack. Serve warm or at room temperature. I got this soup idea from a recipe in the August issue of Food Network Magazine. I adapted it a little to add bell peppers and herbs, and to significantly reduce the amount of unnecessary fat. In a medium stockpot, heat oil over medium heat. Add onion and garlic and cook, stirring occasionally, until onion is soft, about 5 minutes. Add eggplant and peppers and cook, stirring occasionally, until eggplant begins to soften, about 5 minutes (if mixture begins to stick, add a bit of water or more oil). Add tomato paste and cook, stirring frequently, until fragrant and tomato paste turns dark (it caramelizes), about 5 minutes. Add chopped tomatoes and cook, stirring occasionally, until tomatoes soften and give up their juices, about 7-10 minutes. Add broth and thyme and bring to boil. Reduce to a simmer, cover, and cook for 10 minutes or until eggplant is soft. Uncover and add summer squash. Cook, uncovered, stirring occasionally, until squash is tender, about 10 minutes longer. Remove from heat and stir in lemon juice and basil. Serve in soup bowls sprinkled with Parmesan cheese and cabbage (optional).